If you want to learn Microsoft Access inside and out, the nine minibooks in this easy-access reference are exactly what you need. Read the book cover to cover, or jump into any of the minibooks for the instruction and topics you need most. Learn how to connect Access to SQL Server, manipulate your data locally, use nifty new features from Office 2010 such as the enhanced Ribbon, create queries and macros like a champ, and much more. From the basics to advanced functions, it’s what you need to make Access more accesssible. This all-in-one guide contains everything you need to start power-using Access 2010! 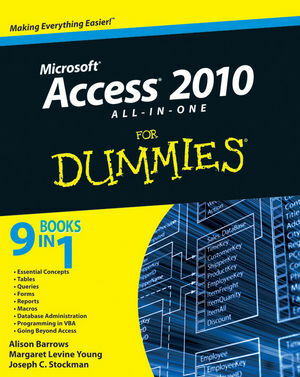 Alison Barrows has written books on Access, Windows, and the Internet, including Access For Dummies Quick Reference. Margaret Levine Young is coauthor of over two dozen books, including The Internet For Dummies. Joseph C. Stockman is an independent consultant, software designer, and author.